With my teenage stepson in the house, my homemade ice cream is very popular! There’s pretty much never not a batch in the freezer… or in the concept phase. He’s unfortunately grown up with the severely limited Danish selection of flavors, and only found out about chocolate chip cookie dough this past summer. I know! Can you imagine? I’ve actually made homemade chocolate chip cookie dough ice cream for him, which was no small feat in a country where pre-made cookie dough doesn’t exist! 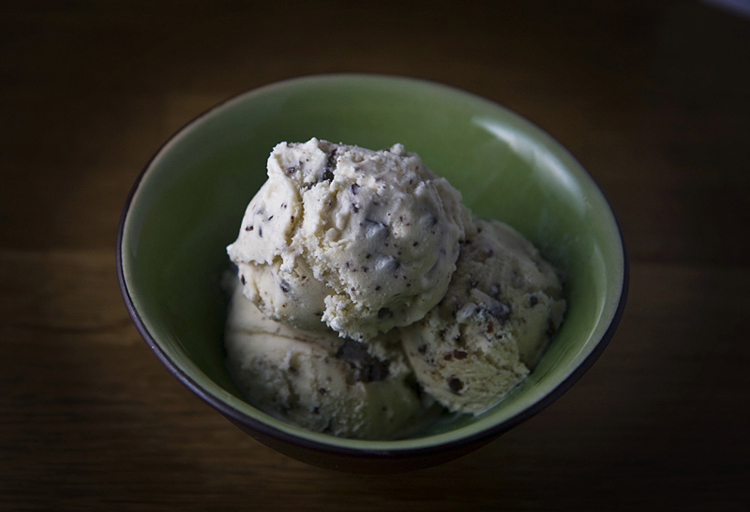 One of my latest creations was this no cook mint chocolate chip ice cream recipe. For some reason, mint always seems wintry to me, and with dark chocolate, it seemed a perfect winter holiday flavor. Since I can’t buy chocolate chips in Denmark, I chopped up some dark chocolate instead. Whisk the eggs for a minute or two in a large bowl, until they’re light and fluffy. Add the creams, the milk, and the peppermint extract, then whisk it for another minute or two. You can also add a few drops of green food coloring here, but I prefer its natural color. Process the mixture in an ice cream maker for 45 minutes to an hour, adding the chocolate during the last 10 minutes of processing. I’m not sure what your definition of an Oik is,,,I had to look it up, not being familiar with the term. Definition I found was “rude or obnoxious person”. Sage – I’m just poking around here – did you really not cook this? You make ice cream with raw eggs? How interesting; but I don’t think I’d have the nerve. Nerve has little to do with it if you use pasteurized eggs, which are sold specifically to be used in uncooked (or lightly cooked) foods.